If you’re traveling with kids, you’ll love Hyatt Regency Scottsdale Resort and Spa at Gainey Ranch. I recommend springing for a one- or two-bedroom parlor suite, depending on the size of your crew. When you’re ready to play, there’s a lot to keep little ones busy . . . a 2.5-acre waterpark, rock climbing wall, sandy beach and more. 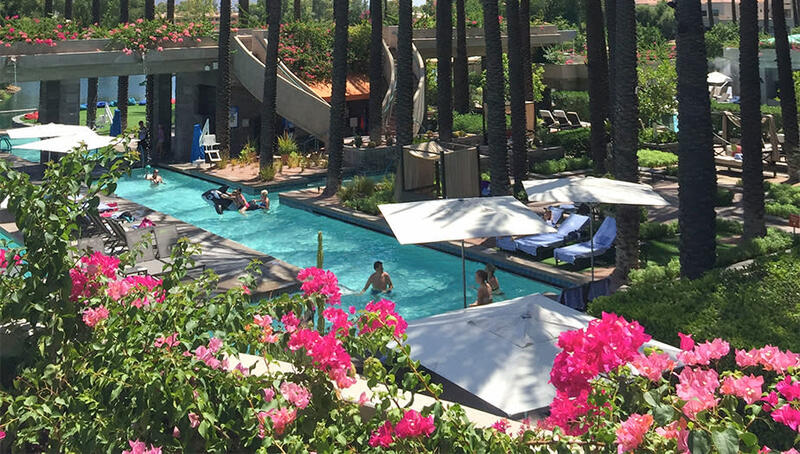 Hyatt Regency Scottsdale is a great option if you’re sans kiddos, too. There’s a separate adults-only pool, sprawling destination spa (more on that later) and an 18-hole golf course next door. Take advantage of that water playground. Let the kids blow off some steam on the 3-story waterslide, or take turns challenging one another to life-size poolside Jenga or Chess. They’ll love swimming their way through the pools, fountains and waterfalls, or digging their teeny toes into the sand. The adults-only pool is much more mellow, so kick back with your buds or beau and a drink or two. You’ve got plenty of delicious dining options at the resort; definitely take full advantage. SWB, a southwest bistro is great for all travelers, including families, with its casual wood-fired Southwestern fare. Alto ristorante e bar (Italian) and Noh (Japanese) are more sophisticated and swank (read: go without the kiddos). Center Stage Bar has live music and is the perfect nightcap. Book a Sonoran Desert adventure – like a rough-and-tumble TomCar ride – directly through Hyatt Regency Scottsdale’s concierge or call up the pros at Arizona Outback Adventures. They’ll take you out on half- or full-day trips of paddling, rafting, kayaking, hiking or biking…your choice! If you’d prefer to go your own pace, hiking the McDowell Sonoran Preserve is the way to go for families (Bajada Nature Trail) and more experienced trekkers alike (Tom’s Thumb). Back at Hyatt Regency Scottsdale, send the kids (if you’ve got ‘em) to Camp Hyatt for some hands-on learning and then hightail it to Spa Avania for a personalized massage or facial that’s synched to the time of day. Speaking of time, give yourself plenty of it to soak in the mineral pool or bask in the sauna or steam shower. Nothing works up an appetite quite like adventuring and spa-ing. Hyatt Regency Scottsdale is a quick ride to downtown. Tuck into James Beard Finalist Chef Charleen Badman’s wholesome American dishes at FnB restaurant or, if you’re dining as a family, check out the kid-friendly menus at Hula’s Modern Tiki and Brat Haus. Of course “nightlife” depends on the kind of trip you’re on…kids love the old-timey ice cream and treats at Sugar Bowl. Coach House, Rusty Spur Saloon, Second Story Liquor Bar and Maya Day & Nightclub are great options for the grown-up set. Though, that’s really only a small taste of Scottsdale’s bar scene. Just stroll the streets of downtown and you’re bound to find a watering hole that suits your style. Your ride from Scottsdale up to Red Rock Country will take just about 2 hours, so plan accordingly. Going wine tasting in Verde Valley? Most of the tasting rooms open around noon. Alcantara Vineyards and Page Springs Winery have some of the area’s best views and wines, but I also love Javalina Leap. If you’ve got time, check out some of the “city” tasting rooms in and around the area, including Cellar 433, Chateau Tumbleweed and Four Eight Wineworks. Amara Resort and Spa is just down the hill of Sedona’s main drag – extremely convenient and one of the best backdrops in town. Wash away the wine brain with a dip in their infinity-edge pool or, if you’ve still got a craving for vino, you’ll be happy to hear there’s a free evening wine hour in the lobby. Whatever you do, don’t miss dinner at Saltrock Southwest Kitchen at the resort. Have a little bit of everything and share a couple of apps (grilled corn dressed in a spicy garlic aioli and soft shell crab with a mustard vinaigrette were my favorites! ), don’t miss the DIY guacamole, and do one each of an order of tacos (I loved the carnitas with pineapple-habanero salsa) and entrée (roasted squash with pickled beats and pepitas = WIN). Of course, you could just simplify the process and opt for the prix fixe menu (3 courses for $45). There’s really no need to leave the property tonight when your sunset comes with a Red Rock backdrop. Amara takes full advantage of its surroundings with a mountain-facing lawn decked in comfy Adirondack chairs and classic lawn games. Grab a West Fork Margarita (jalapeno tequila and agave nectar) from Saltrock and toast to the end of your first day in Sedona. Sedona’s West Fork Oak Creek Trail is the most popular hike in the Coconino National Forest for a reason – think whispering pines, babbling brooks and chipper songbirds. It’s beautiful no matter the time of year, but fall brings brilliant flashes of red and gold. And when I say hike, I really mean “leisurely walk,” because it’s a fairly easy trek. 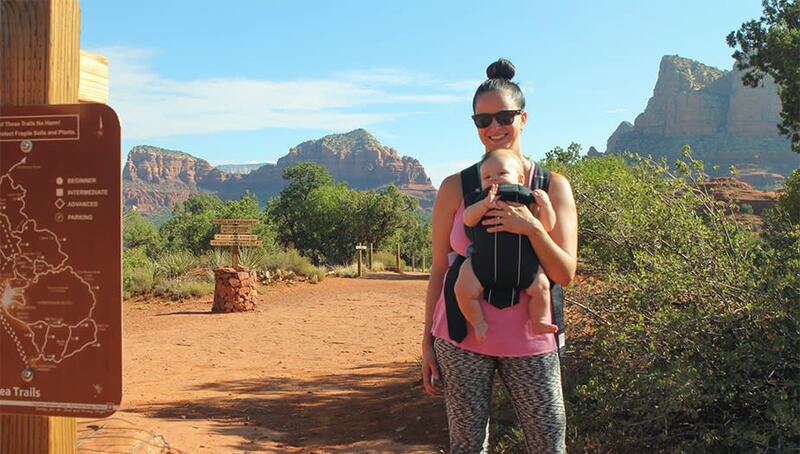 If you’re looking for a challenge, try either the Upper Bell Rock Trail or The Ascent at Bell Rock, though its Lower Bell Rock Trail is even ground, easy, and has those quintessential Sedona views. That’s what we did with our 6-month-old daughter – and we all loved it! Tip: When hiking, be sure to see if a Red Rock Parking Pass is needed to leave your car unattended at the trailhead. Make a lunch stop at Hideaway House. The sprawling wraparound patio puts you right on top of Oak Creek. The views are just as delicious as the food; post-hike we opted for the massive wine lover’s board with sliced Italian meats and cheeses, marinated veggies and tasty spreads, plus some Arizona beer to wash it all down. Back at Amara, you’ll want to kneed away those sore muscles with their signature Butterfly Wrap…a full-body massage that starts with a vanilla sugar scrub and ends in a soft cocoon wrap and scalp massage. The spa brochure says you’ll leave feeling transformed. I know it sounds like a marketing gimmick but, trust me it’s true. Do yourself this favor! On the way back to Scottsdale, plan for a pit stop at Tom’s Thumb Fresh Market. No doubt you’ll pull into the parking lot and think I’ve lead you to a gas station. I have; but go inside and you’ll find some of the best smoked BBQ in the Southwest.